First off, I can't tell you how exciting it is to have mentors who actually support this blog! These days, having a blog can be somewhat of a deterrent for employers for whatever reason, however I love how so many of you are telling me that you read this thing and actually enjoy it! So thank you, it means so, so much to me. Second, what this post is about! Red Carpet Check-in: 6:00 p.m.
WEST HOLLYWOOD -- Education is always in style. The Academy of Couture Art in Los Angeles invites you to celebrate the academic and practical achievements of their inaugural graduating class. 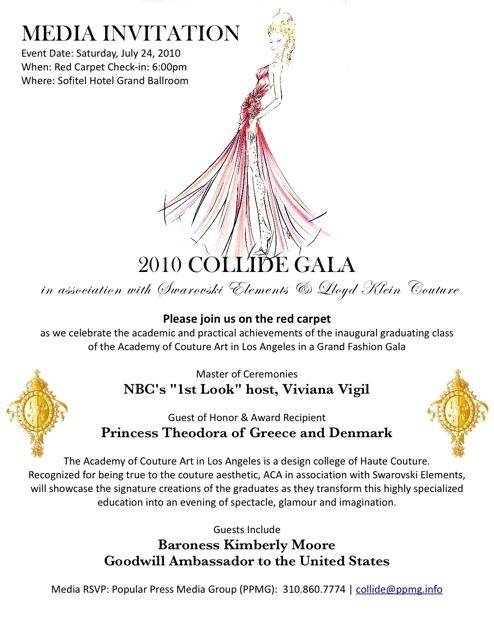 The 2010 Collide Gala will commemorate this occasion at the Sofitel Grand Ballroom in West Hollywood, with NBC's "1st Look" host Vivianna Virgil commencing as the Master of Ceremonies. The night will include the signature creations of the graduates in a runway show, showcasing their talent and vision which have been cultivated at ACA in the duration of their education.